We are looking to incorporate a Junior Media Planner, to join our team in Valencia. In this role will you be responsible for supporting the full sales and planning cycle from pre-sales through campaign execution and reporting. Mostly, you are motivated and desire to grow professionally in a young environment with international projection. If you are interested, send us your resume to karina@animaads.com. 1 o 2 años de experiencia como Planificador de medios. Buen dominio de Inglés (Muy valorables otros idiomas). Buen manejo de Paquete Office (Excel, Power Point). Sobre todo, buscamos PERSONAS con motivación y ganas de crecer profesionalmente en un ambiente joven y con proyección internacional. Envíanos tu currículum a hola@animaads.com y estaremos encantados de conocerte. The latest global advertising expenditure forecasts, covering 59 markets across the Americas, Asia Pacific and EMEA, show advertising spend remains healthy in 2016, increasing globally by US$23 billion in 2016 to hit US$548.2 billion, a +4.4% year-on-year increase compared to 2015. Digital is once again the key driver and established star performer of 2017 followed by TV and OOH. Growing by +13.6%, Digital will contribute to US$20.1 billion spend increase next year, representing more than 90% of the total incremental media spend offset by declines in Print. Television continues to command the highest share of total media spend globally with 41.1% in 2016 and a predicted 40.3% in 2017. Compared to the multiple media types available within Digital, TV is forecast to remain the single largest investment point for advertisers. However since its peak in 2010 at 44.0% share of total spend, TV has been on a slow declining trend with share decreasing by on average 0.5% points annually in the past five years. TV advertising spend is forecast to grow by +3.0% in 2016, supported by high-interest media events including the UEFA EURO 2016 football championship, Rio 2016 Olympics and Paralympics and the US presidential elections. TV advertising spend is expected to grow at a more moderate pace of +2.3% in 2017, slightly revised down from Carat’s predictions in March 2016. Globally Newspapers continue to be the third largest media type, behind total Digital and TV, with 11.0% share of total advertising spend in 2016 but continue to decline by over one percentage point each year since 2008, to drop to a predicted 9.9% share of spend in 2017. Magazines are experiencing a similar declining trend albeit at a slower rate with a 6.4% share in 2016, falling to 6.0% in 2017. As Digital continues to grow, traditional Print publishers, especially Magazines, are increasingly aiming to broaden their total audience reach across multiple platforms including Digital channels. Cost effectiveness and flexibility contribute to maintain demand for Radio, predicted to account for 6.4% total share of spend in 2016 and 6.2% in 2017, but with slow growth rate of +2.4% in 2016 and +0.6% next year. OOH is growing relatively strongly at +3.5% in 2016 and +3.4% in 2017, with stable share of spend of 6.9% in 2016 and 6.8% in 2017. Advances in technology, such as the digital transformation of public space and data usage, will continue to shape this media type creating new exciting opportunities for advertisers for more personalisation and relevance. With increased commercial flexibility making it easier for advertisers to adapt spend to the big screen, Cinema is forecast to continue to grow globally by +4.5% in 2016 and +4.6% in 2017. Globally, Digital media spend is forecast to reach 27.7% share of total media spend in 2016 increasing to 30.2% in 2017, showing an average increase of 2.5% points each year during the past five years. Digital media currently commands the highest share of spend in Sweden (54.5%) followed by the UK (53.6%) and Denmark (50.1%). In 2017 Digital media spend in Australia and the Netherlands is also predicted to tip over the 50% mark for the first time. Social media spending is forecast to increase globally at a high double-digit rate of +35.3% in 2016 and +28.7% in 2017. Social platforms are consistently improving their ability to gather data and provide marketers with actionable insights to reach and engage withtheir target audiences. Since the launch of Facebook Live for all users, the popularity of live content has steadily increased with consumers watching live video three times longer than pre-recorded content. The upsurge of Social Media and Mobile is also contributing to the growth of Online Video advertising spend, forecast to increase globally by a strong +41.3% in 2016 and +32.8% in 2017 as brands consistently create and invest in video content to be distributed and curated online. Online Video is increasingly becoming more mobile, with over 117 million people in the US alone watching video on their mobile devices in 2016. This is expected to continue to grow by 6% in 2017, reaching nearly 124 million users. YouTube continues to be a scalable platform for premium video inventory making it easier to embed advertising messages within top performing content. Programmatic spend is forecast to increase at a rapid rate of +32% in 2016 and further +25% in 2017. Programmatic initially had advertisers focused on cost efficiencies and a more effective performance. While that is still the case, the growth can be attributed to the ability to deliver better business outcomes with access to all types of scalable inventory including premium video and social. Following the negative press that open exchange inventory has been receiving, the industry is now deploying brand safety best practices and adopting a private marketplace strategy that is transacted programmatically. These private marketplaces are not only providing guard rails around brand safety, but also improving viewability metrics and assurances around inventory. Boosted by the considerable rise of programmatically booked inventory, Display (Banners) spend, including desktop and Mobile, is forecast to increase by +12.4% in 2016 and +9.6% in 2017. Global ad expenditure will grow 4.7% in 2016 by ZenithOptimedia executive summary, reaching US$579 billion by the end of the year. This will be a 0.8 percentage point improvement on 2015: 2016 is a ‘quadrennial’ year, when ad expenditure is boosted by the Summer Olympics, the US presidential election and the UEFA football championship in Europe. The global ad market has enjoyed stable growth since 2011, with growth rates ranging between 4% and 5% a year, and we expect it to maintain this pace for the rest of the forecast period. Since the December 2012 edition of our forecasts we have looked at the growth rates of different regional blocs defined by the similarity of the performance of their ad markets as well as their geographical proximity. This captures the behaviour of different regional ad markets more effectively than looking at regions defined purely by geography, such as Western Europe, Central & Eastern Europe and Asia Pacific. See the end of the Executive Summary for a complete list of countries by bloc. At the end of last year we revised the definition of these blocs. We used to separate the Peripheral Eurozone (Portugal, Ireland, Italy, Greece and Spain) from Northern and Central Europe, because the periphery was substantially weaker. However, the performance of the two regions has now converged, and we have combined them into a single region called Western & Central Europe. For several years the ad markets at the periphery of the eurozone were by far the worst-performing in Europe, which was why we separated them out in a bloc called the Peripheral Eurozone. Between 2007 and 2013, adspend fell 29% in Italy, 38% in Ireland, 43% in Portugal, 47% in Spain and 62% in Greece. However, the last four began to make strong recoveries in 2014. Greece’s recovery went into reverse in early 2015 as the government geared up to confront its creditors, but over the rest of our forecast period we expect Ireland, Portugal and Spain to outperform the average rate for Western & Central Europe, admittedly from their much-reduced base levels. We forecast Ireland to grow at an average 7.6% a year between 2015 and 2018, while Portugal grows by 4.8% a year and Spain by 6.6% a year. Meanwhile, France is lagging behind with weak business confidence and household consumption. We forecast French adspend to grow only 0.5% a year on average between 2015 and 2018. This will be the slowest growth rate in the region, with the exception of Slovenia, where increased competition among television broadcasters is pushing down prices, and we expect no growth at all over the three year period. Other slow growth markets include Finland (0.9% growth a year to 2018), Norway (1.3%), Switzerland (1.3%), Austria (1.7%) Germany (1.8%), Italy (1.9%) and Greece (1.9%). Outside the eurozone, the stand-out ad market in Western & Central Europe is the UK, which is currently booming thanks to the rapid adoption of internet advertising. We predict UK adspend will grow 7.0% in 2015, and at an average of 6.3% a year to 2018. We expect growth in the UK and the peripheral eurozone markets to counterbalance the weaker markets, allowing Western & Central Europe to grow at an average of 3.3% a year between 2015 and 2018. Eastern European advertising markets, such as Russia and Turkey, generally recovered quickly after the 2009 downturn and continued their healthy pace of growth, largely (though not entirely) unaffected by the problems in the eurozone for the next four years. Their near neighbours in Central Asia, such as Azerbaijan and Kazakhstan, have behaved very similarly, so we have gathered them together under the Eastern Europe & Central Asia bloc. This bloc grew 11.4% in 2013. The conflict in Ukraine severely disrupted the domestic ad market, while Russia has suffered from sanctions imposed by the US and the EU, the sanctions it imposed in response, and a withdrawal of international investment. These shocks have been exacerbated by a sharp drop in the price of oil – which accounted for 70% of Russia’s exports in 2014 – and devaluation of the Ukrainian and Russian currencies. These problems have since spread to Belarus, whose main trading partner is Russia by some distance. We forecast adspend in Ukraine to shrink 44.5% this year, on top of a 37.9% decline in 2014. We also forecast a 17.2% decline in adspend in Belarus this year, following 7.6% growth in 2014. Russian adspend grew just 4.3% in 2014, which was the first year of growth below double-digit rates since 2009, and we expect the market to shrink by 10.6% this year. This is an improvement on the 14.1% decline we forecast in September; Russia’s ad market has been more resilient than we feared, with a slowdown in decline in the second half of the year and recovery in prospect for 2016. Overall we expect adspend in Eastern Europe & Central Asia to shrink by 7.5% in 2015. In the past adspend in this region has been volatile, with large declines swiftly followed by rapid gains. In this case, we think the region will be slower to recover, and we forecast just 1.0% growth in 2016, followed by 6.8% in 2017 and 7.4% in 2018. Japan behaves differently enough from other markets in Asia to be treated separately. Despite recent measures of economic stimulus, Japan remains stuck in its rut of persistent low growth. We forecast adspend growth of 2.7% a year between 2015 and 2018. Apart from Japan, there are five countries in Asia with developed economies and advanced ad markets that we have placed in a group called Advanced Asia: Australia, New Zealand, Hong Kong, Singapore and South Korea. We estimate growth here at a disappointing 2.7% in 2015, as Singapore has continued to suffer from a weak property market, and slowdown in China and other emerging markets has hit exports from all markets. We expect growth in Advanced Asia to average 2.2% a year through to 2018. We characterise the rest of Asia as Fast-track Asia (China, India, Indonesia, Malaysia, Pakistan, Philippines, Taiwan, Thailand and Vietnam). These economies are growing extremely rapidly as they adopt Western technology and practices, while benefiting from the rapid inflow of funds from investors hoping to tap into this growth. Fast-track Asia barely noticed the 2009 downturn (ad expenditure grew by 7.9% that year) and since then has grown very strongly, ending 2014 up an estimated 10.7%. However, the Chinese economy – the main engine of growth in Fast-track Asia – is finally starting to slow after years of blistering growth, and the ad market is slowing down alongside it (although with an official target of 7.0% GDP growth in 2015, China’s growth rate remains one most markets will envy). China accounts for 74% of adspend in Fast-track Asia, so its slowdown naturally has a large effect on the region as a whole. We expect ad expenditure in Fast-track Asia to grow 8.9% in 2015, and at an average rate of 8.4% a year between 2015 and 2018, down from 14.7% a year between 2009 and 2014. We have not changed the definition of North America, Latin America or the Middle East & North Africa (MENA) in this analysis. North America was the first region to suffer the effects of the financial crisis, but it was also quick to recover, and adspend in North America has been more robust than in Western & Central Europe since 2012. Adspend growth was boosted to 4.7% in 2014 by the Winter Olympics and mid-term elections in the US; in their absence we expect growth to subside to 3.5% in 2015. In 2016 the market will benefit from the 2016 Summer Olympics and the US Presidential elections, but growth will be constrained by ongoing decline in network television adspend as ratings continue to slide. We forecast 3.8% growth in 2016, and an average of 3.4% a year to 2018. Latin America’s economies are more volatile than those of Fast-track Asia, but lately it has been restrained by low prices for oil and other export commodities, and recession in Brazil. We estimate that Latin American adspend will be up 6.0% in 2015, and will grow just 4.8% a year in 2016 despite the presence of the 2016 Summer Olympics, hosted by Brazil. Growth should average 4.0% a year to 2018. For this edition we have thoroughly overhauled our historic advertising expenditure figures in MENA, based on new information on actual spending levels in comparison to monitored spending measured at ratecard. Our new forecasts are all based on these revised historic figures. The drop in oil prices in 2014 has had a severe effect on the economies in the region, and has prompted advertisers to cut back their budgets in anticipation of lower consumer demand. We forecast an 11.1% drop in adspend in MENA this year, followed by a further decline of 6.8% in 2016. We then predict a slow recovery with 1.5% growth in 2017 and 4.3% in 2018, averaging a 0.4% decline a year from 2015 to 2018. Since it began in the mid-1990s, internet advertising (both desktop and mobile) has principally risen at the expense of print. Over the last ten years internet advertising has risen from 6% of total global spend in 2005 to 29% in 2015. Meanwhile newspapers’ share of global spend has fallen from 29% to 13%, while magazines’ has fallen from 13% to 7%. Print titles will continue to lose market share as their readership continues to decline, either move to online versions of print brands or other forms of information and entertainment entirely. We predict newspapers and magazines will continue to shrink, at average rates of 4% and 3% a year respectively, between 2015 and 2018, ending with respective 10% and 5% market shares. Note that our figures for newspapers and magazines include only advertising in printed editions of these publications, not on their websites, or in tablet editions or mobile apps, all of which are picked up in our internet category. The performance of print editions does not wholly describe the overall performance of newspaper and magazine publishers. Television is currently the dominant advertising medium, expected to attract 38% of total spend in 2015. As mentioned earlier, however, we now expect the internet to overtake television to become the largest medium in 2018. Looking at the ad market as a whole, including search and classified, we think television’s share peaked at 39.7% in 2012, estimate it at 37.7% in 2015, and expect it to fall back to 34.8% by 2018. However, one of the reasons for television’s loss of share is the rapid growth of paid search, which is essentially a direct response channel (together with classified), while television is the pre-eminent brand awareness channel. Television does not compete directly against search, and indeed the two can complement each other, for example by running paid search activity take advantage of the increase in searches driven by a television campaign. Taking internet classified and search out of the picture, television will remain the principal display medium for many years to come. We estimate television will account for 44.7% of display expenditure in 2015, and 42.9% in 2018. If we consider audiovisual advertising as a whole – television plus online video – we see that it is in fact gaining share of display advertising. Television offers unparalleled capacity to build reach, while online video offers pinpoint targeting and the potential for personalisation of marketing messages. Both are powerful tools for establishing brand awareness and associations. We estimate that audiovisual advertising will account for a record 48.4% of display advertising in 2015, up from 44.1% in 2010, and expect its share to reach 48.9% in 2018. In this section we draw on country data on brand performance along with questions asked elsewhere in the survey about the types of news sources accessed online and offline. We can see that in some countries like Finland and Denmark, traditional newspaper brands still dominate online news. In the UK and Brazil broadcast brands take the largest share, with newspapers playing a lesser role. By contrast, in Japan, Brazil, Australia, and the US there has been far more impact from digital-born players. Aggregators and new digital native news companies may be gaining ground but they still produce a very small proportion of original journalism. The majority of journalists are still employed by companies that built their reputation from newspapers, which is why there is so much concern about their long-term sustainability in a digital age. 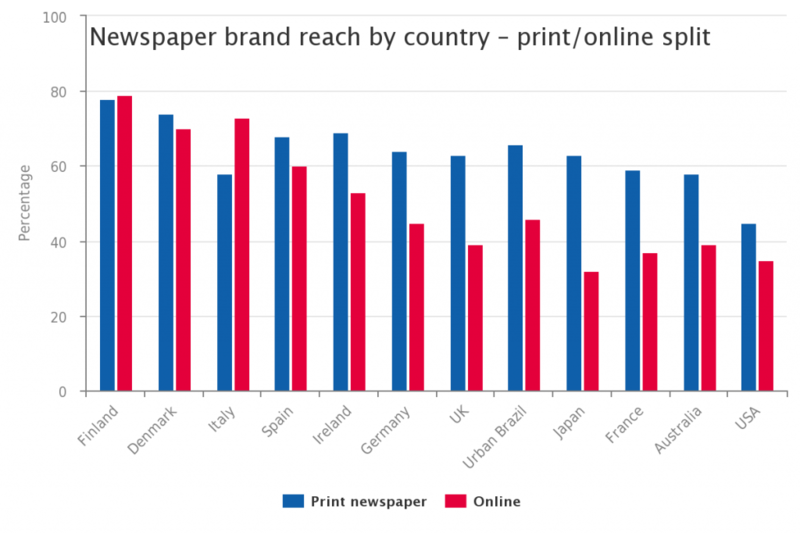 Overall we find that three-quarters of our sample (74%) across all countries access a newspaper brand each week but in most countries the audience share coming from the online part of the operation grows every year. Q5a/b. Which, if any, of the following have you used to access news in the last week? Via traditional platforms/online. Some countries like Finland have seen newspapers transferring a traditional strength in print to online usage. Two-thirds of our sample (64%) use these brands in both print and online, with a total reach of 93%. This is partly because Finland, as a small country, has been less disrupted by outside forces – protected by language and culture. But the position of newspapers in Australia, the United States, and Japan is very different. Across our sample we see that the vast majority (89%) are using a broadcaster brand via TV, radio, website, or app to access the news. But for these public service or commercial channels the main focus – and the main audience – remains with television and radio. Audience levels and business models around broadcast news have not been disrupted to the same extent as print. Indeed for most, online news has been an opportunity to extend services and overall reach by competing head to head with newspapers around text news. The success of TV brands online has partly depended on the extent to which they have been able to compete directly with newspapers. In Brazil, commercial Globo has invested heavily in its online services and is the largest and most successful brand at 25% share online. 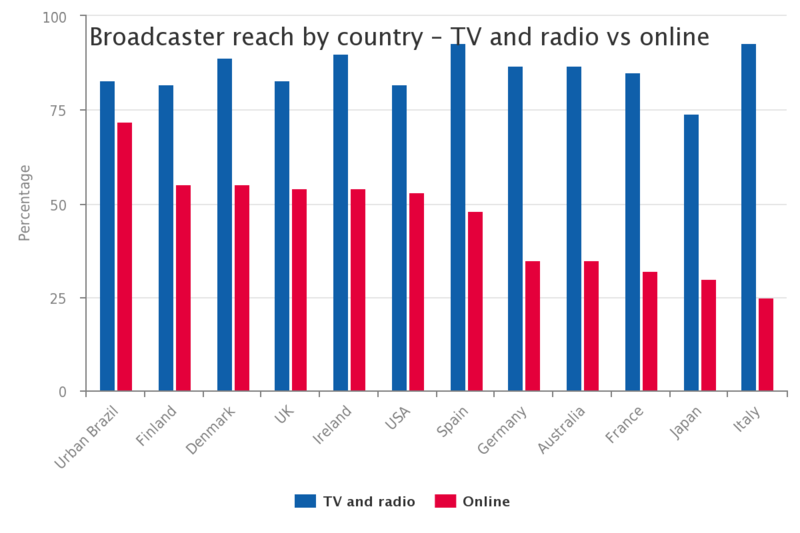 Public broadcasters in Finland, Denmark, and the UK have faced little restriction on their ability to leverage their considerable investments in journalism online. By contrast NHK in Japan, RAI in Italy, and public broadcasters in Germany and France have faced financial, political, or organisational constraints. In all cases, the impact of greater competition online means that even the most successful broadcasters end up looking much smaller online. Here are a few examples. Q5a/b. Which, if any, of the following have you used to access news in the last week? Please select all that apply. Via traditional platforms/online. Base: Total sample in each country. RAI offline estimated as TG1,2,3 combined with RAI News with an assumption of 66% TG1,2,3,4,5 code. France Television a combination of FTV and FTV.info. 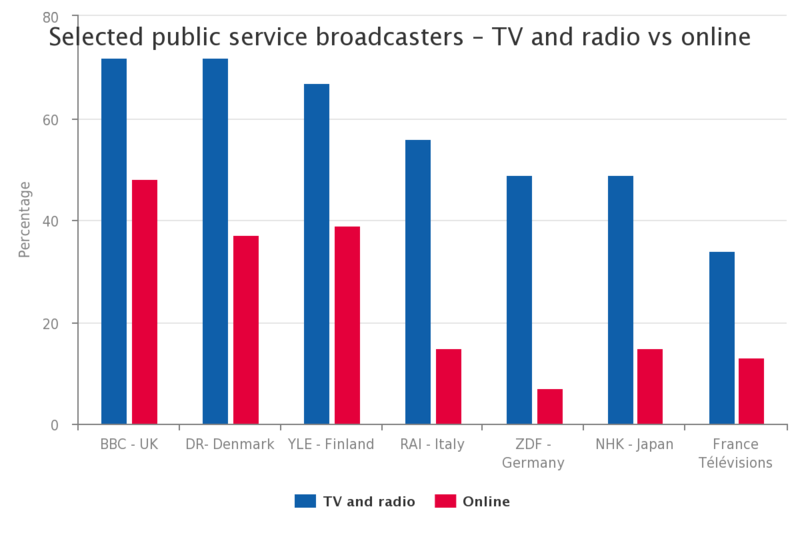 Combined with data showing that online users continue to regularly access TV news (75%), radio news (37%), and print (41%), this shows that online is not replacing traditional media but is mainly being used as an additional layer extending choice and convenience. 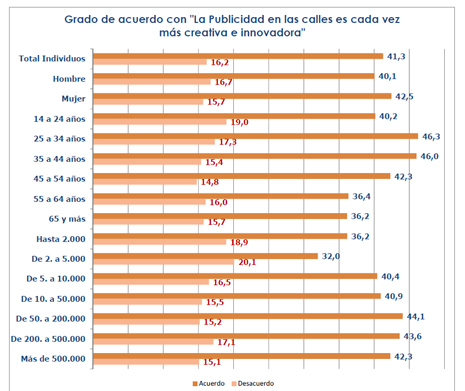 Las previsiones sobre la evolución de la inversión publicitaria siguen mejorando. Los directivos de medios esperan un crecimiento del 5,2% para este año, un punto más que la cifra apuntada hace dos meses. No obstante, la tendencia es tan positiva, que muchos esperan cerrar el año con un incremento del 8%. Siempre que no se produzca un cambio brusco en el panorama económico. 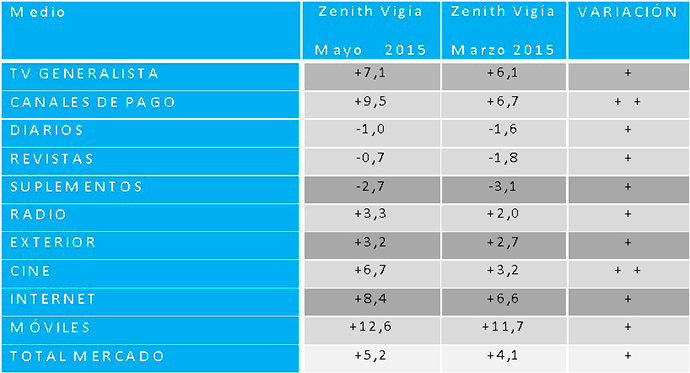 El panel Zenith Vigía muestra, además, como el IPSE (Índice de Percepción de la Situación Económica) continúa mejorando y superar de nuevo su mejor marca histórica subiendo desde marzo más de seis puntos y situándose en 87,7. El IPMP (Índice de Percepción del Mercado Publicitario) también mejora, casi seis puntos, hasta los 91,5. Hay que retroceder hasta 2005 para encontrar valores más altos. El hecho de que el IPMP se sitúe por encima del IPSE (aunque los dos en valores muy elevados) se interpreta como un claro signo de recuperación económica. 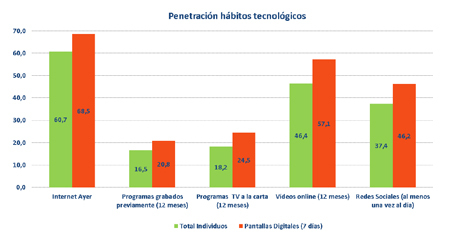 Móviles, Televisión (en especial los canales de pago), Internet y Cine crecerán por encima de la media del mercado. Radio y Exterior también lo harán, pero menos que el mercado. Revistas, Diarios y Suplementos seguirán viendo como sus ingresos se reducen, pero poco a poco se aproximan al punto de estabilidad. Dentro del capítulo de los medios no tradicionales, los panelistas creen que la inversión en Blogs y sitios especializados podría alcanzar este año los 12,7 millones de euros, lo que supondría un crecimiento superior al 9% respecto al año anterior. La inversión en Redes Sociales podría alcanzar este año los 49 millones de euros, lo que supondría un incremento del 15% respecto a la cifra estimada para 2014. A su vez, el vídeo en Internet podría captar este año 54,3 millones de euros, con un aumento del orden del 23% respecto al año 2014. La combinación de vídeo, redes sociales y móviles es uno de los motores más potentes de la inversión digital. El fuerte crecimiento en el número de pantallas y la incorporación a esta modalidad de los grandes exclusivistas del sector Exterior han provocado un fuerte incremento en la inversión en digital signage, que podría duplicar las cifras de años anteriores. Casi con toda seguridad superará los 22 millones de euros, aunque según algunos expertos del sector se mueve ya en el entorno de los 30 millones. AIMC Marcas ha dado a conocer los resultados del último estudio elaborado por la Asociación para la Investigación de Medios de Comunicación (AIMC) basado en más de 10.000 entrevistas que ofrece datos sobre los hábitos de consumo de los españoles. El estudio de AIMC Marcas ofrece de esta manera una radiografía de cómo es la realidad de la publicidad en las pantallas digitales. Entre las conclusiones que se desprenden del mismo cabe destacar que la publicidad exterior está siguiendo las últimas tecnologías en nuestro país. Lo ciudadanos no son ajenos a estos cambios y un 41,3% de estos está “de acuerdo” en que “la publicidad en las calles es cada vez más creativa e innovadora”, frente a un 16,2% que se muestra en “desacuerdo”. 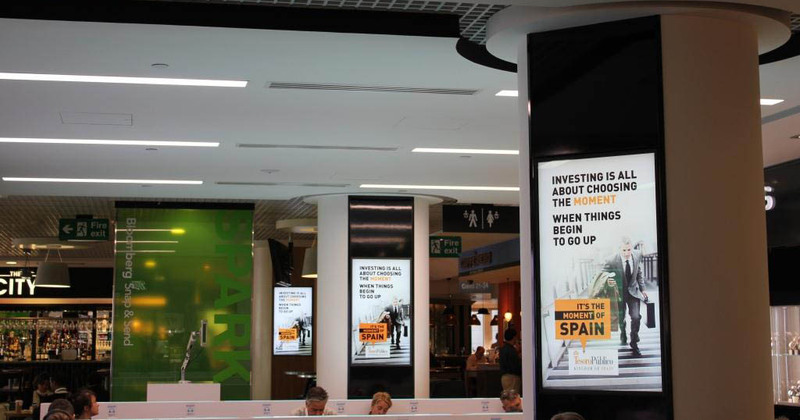 Esta percepción está vinculada a la creciente introducción del digital signage en nuestro país. Son los adultos con edades comprendidas entre los 25 y los 34 años (46,3%) los que consideran que la publicidad exterior está cada vez más a la vanguardia en materia de nuevas tecnologías seguidos por los ciudadanos con edades que se encuentran entre los 35 y los 44 años (46%). Por comunidades autónomas, Canarias (49,6%), Murcia (49,6%) y Aragón (45,3%) son las regiones en las que les resulta más perceptible el cambio que está experimentando este tipo de publicidad, mientras que Cantabria (36,8%) y Baleares (34,1%), son las regiones donde resulta menos evidente esta transformación. Los lugares en los que podemos encontrar las pantallas digitales como soportes publicitarios siguen siendo igual de variados con la incursión del digital signage. No podemos olvidar que el visionado de un anuncio depende de varios factores entre los que destacan la probabilidad de exposición al mismo con la que cuente el individuo así como el interés que este y la tecnología que lo acompaña supongan para los usuarios. El estudio revela que los lugares con mayor éxito para la colocación de la publicidad exterior son los “centros comerciales” (24,1%), seguidos de las “carreteras y calles” (20,7%), el “metro” (10,4%), las “estaciones de tren” (6,0%) y, por último, los “aeropuertos”, con un 4,8%. Atendiendo a datos de género, el visionado realizado a lo largo de los últimos siete días es mayor en los hombres aunque las diferencias con las mujeres son, en términos relativos, menores en el caso del metro (11.5% frente a un 9.4%) y mayores en el caso de los aeropuertos (5,7 frente a un 3,9). Por Comunidades Autónomas, la mayor penetración del recuerdo de visionado de publicidad en pantallas digitales en centros comerciales se da en Murcia (34,0%), seguida de Canarias (30,0%) y Andalucía (28,8%). En el caso de las Carreteras y Calles, Andalucía (25,9%) y Madrid (25,5%) son las Comunidades Autónomas que registran los valores más elevados. En los aeropuertos destacan los datos de Baleares (11,0%) y Canarias (9,7%), a gran distancia del 4,8% del total nacional. En el caso de las estaciones de tren, Madrid (12,2%) y Cataluña (9,3%) son las comunidades a destacar, y también lo son en el caso del metro, con un 28,9% y un 20,2% respectivamente. El estudio ofrece conclusiones bastante completas que van más allá de los datos sociodemográficos. Es posible saber que el perfil al que le interesa este tipo de publicidad exterior son individuos que están relacionados con la tecnología. Además, existe una relación entre la conexión diaria a internet y el interés en este tipo de publicidad. Estos individuos también son asiduos a las redes sociales con un 46,2% de estos que las consulta a diario frente al 37,4% de los españoles. También se presentan como consumidores de vídeo online: el 57,1% ha visto alguno en el último año, frente al 46,4% de la población. Es un hecho que las posibilidades de estar expuesto a las pantallas digitales aumentan fuera de casa. El estudio AIMC Marcas muestra cómo el target impactado pasa como media 26 minutos más fuera de casa que el total de la población. Además, dicho target muestra, en relación a la población total, una mayor práctica de aquellas actividades que implican salir fuera de casa: “salir a pasear” (55,6%), “hacer compras” (35,5%) o “ir al cine/teatro/restaurantes” (25,1%). A study of numbers of users across the entire media universe released by Nielsen reveals that the old standbys are, well, standing by. Traditional TV viewing (i.e. not DVD, Blu-Ray, or time-shifted) remains the most popular medium by far with 285 million users in the United States. Following close behind is TV’s longtime companion, AM/FM radio, with 258 million listeners. Nielsen, which has been making a concerted effort toward going digital lately, undertook the study to illustrate the fact that consumers are decidedly cross-channel. Considering that the U.S. population currently stands at about 316 million, it succeeded. Some 198 million people surf the Internet on a computer, while 164 million tap into the Web and use apps on smartphones; 146 million people watch videos on the Internet and 122 million do so on smartphones. Social media is now primarily accessed via mobile devices, with 142 million people going that route and 133 million using computers. The user numbers are all from Q4 2014, and were obtained from Nielsen’s NPOWER/NPM Panel, Netview, Nielsen VideoCensus, Nielsen Electronic Measurement Radio, and RADAR 123. IAB Spain, la Asociación de la publicidad, el marketing y la comunicación digital en España, ha presentado hoy el III Estudio Anual de Digital Signage o cartelería exterior digital, elaborado junto con la empresa asociada VIKO y en colaboración con Playthe.net, además de estar liderado por la Comisión de Digital Signage. Este estudio tiene como objetivo mostrar un análisis del sector del Digital Signage en España. A continuación se desglosan las características principales desveladas en el Estudio según los siguientes parámetros. Las pantallas digitales son conocidas por el 94% de los internautas tras mostrar ejemplos, 43% antes de mostrarlos. Esto implica un amplio conocimiento, pero a la vez una falta de percepción del usuario como un nuevo entorno unificado. Por otra parte, las estaciones y aeropuertos (75%), junto con los centros comerciales (75%), son los lugares donde más se recuerda haber visto una pantalla digital. Le siguen el exterior, como la calle o las carreteras (62%) o los propios establecimientos (47%). El estudio afirma que el 66% de los usuarios ha usado alguna vez una pantalla digital. Los usos van desde proporcionar información útil (38%), a influir en la decisión de compra (31%), pasando por hacer pensar en la marca (28%), generar interacción (26%) o incitar a buscar más información (22%). El 95% de los usuarios conoce algún método de interacción con los soportes, y un 74% de ellos reconoce haber interactuado alguna vez. En cuanto a la interactividad con pantallas digitales,la pantalla táctil es el método más extendido (37%), seguido del código QR (28%), invitación a conectarse por redes sociales (16%) o el Bluetooth (12%).